With an established reputation as one of Canada’s leading saxophonists, Kirk MacDonald cut his first record at the age of thir-teen. Throughout his career, he has received numerous awards, and has worked with many leading musicians in a variety of musical genres. He has performed on over fifty CDs as both leader and sideman, and has participated in numerous national broadcast recordings for CBC Radio. In addition to performing extensively throughout Canada, he has also performed in the USA, Spain, France, Italy, Holland, Monaco, Australia, Korea, Bermuda, and the Bahamas. 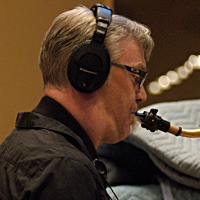 For over thirty years Kirk has worked and recorded with many leading Canadian, U.S. and International jazz musicians including Claude Ranger, Dave Young, Sam Noto, Sonny Greenwich, Kenny Wheeler, Eddie Henderson, Harold Mabern, Walter Bishop Jr., Tom Harrell, Lorne Lofsky, Bob Mover, Pat LaBarbera, John Taylor, Ron McClure, Jack DeJohnette, Mike Stern, Jim McNeely, Bob Mintzer, Vince Mendoza, John Clayton, Chris Potter, Glenn Ferris, Maria Schneider, Dave Grusin, Danilo Perez, Adam Rogers, Dennis Mackrel, Nancy Walker, Barry Romberg, Andre White, Rob Smith, Brian Dickinson, Denny Christianson, Bernie Senensky, Phil Nimmons, James Moody, Rosemary Clooney, Humber College Faculty Ensemble. Over 100 performances of his compositions appear on 24 CDs, both as leader on his own recordings as well as on recordings by other artists. Kirk’s most recent activities include the release of Family Suite (2008), an 11 part suite for jazz quartet on Romhog Records, and Songbook Vol. I (2009) – a collection of his compositions for jazz quartet, on ADDO Jazz Records, with Songbook Vol. II (2010). 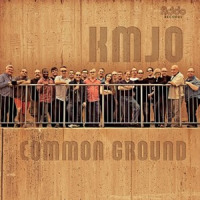 Kirk also leads the Kirk MacDonald Jazz Orchestra (KMJO), a 19-piece all-star ensemble dedicated to performing his original compositions and featuring arrangements by leading Canadian and U.S. Writers. 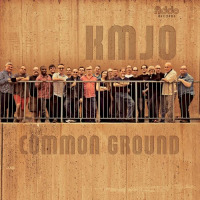 The KMJO released its debut record-ing Deep Shadows in March 2011, and in May of 2012 released a re-working of Family Suite for Large Ensemble. 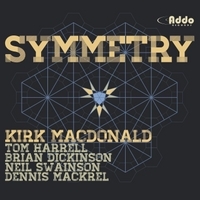 In the fall of 2013 Kirk’s eleventh recording Symmetry was released, featuring jazz great Tom Harrell. His latest recording Vista Obscura was released in 2014 and features jazz legend Harold Mabern and special guest saxophonist Pat LaBarbera. Kirk has been active as an educator for 27 years at leading jazz studies programs such as at the University of Toronto and McGill University. Kirk is presently a full time professor at Humber College in Toronto, where he holds a cross appointment in the Music Degree Program and the Community Music School. Kirk also acts as the Artistic Director for the “Youth Jazz Canada” project and directs the “National Youth Jazz Combo”. This project also hosts a 2 week workshop in the summer for high school and post-secondary students. Kirk MacDonald: Symmetry Following two splendid albums as leader of his own big band (Deep Shadows, Family Suite for Large Jazz Orchestra), Toronto-based saxophonist / educator Kirk MacDonald has returned to a small-group format for Symmetry, the thirteenth recording on which his name has been listed atop the marquee. In this case, however, any member of MacDonald’s quintet could have easily laid claim to the honor, as every one is an all-star in his own right, from the renowned trumpeter Tom Harrell, who shares the front line, to the exemplary rhythm section comprised of pianist Brian Dickinson, bassist Neil Swainson and drummer Dennis Mackrel. Granted, assembling five world-class musicians in a studio to record doesn’t always pay dividends. Here, however, the idea seems truly inspired, thanks in part to their easygoing rapport and in even larger measure to MacDonald’s admirable compositions and arrangements, which bring out the best his colleagues have to offer. In the liner notes, MacDonald writes that he was searching for “beauty as a result of balance or harmonious arrangement.” Mission accomplished, starting with the shapely title selection and continuing through the nimble finale, “Bop Zone.” MacDonald later amplifies the remark, pointing out the genesis and form of each arrangement, but that is best left for musicologists to read and assimilate. Suffice to say that MacDonald has readily achieved his purpose. “Bop Zone” is especially well-suited to MacDonald whose robust, darting tenor solos bring to mind such bop-era (and later) flame-throwers as Hank Mobley, Johnny Griffin, Teddy Edwards, George Coleman, Harold Land and Charlie Rouse, among others, not to mention such contemporaries as Lew Tabackin, Don Menza, Joe Lovano and Canada’s own Pat LaBarbera. As for Harrell, he is as always a model of tastefulness and consistency on trumpet or flugel, pouring years of invaluable discipline and experience into every persuasive solo. Dickinson and Swainson make the most of their moments in the sun (each is bright and perceptive whether out front or lending support), while Mackrel toils earnestly to help keep the rhythm sharp and steady. Even though no one is likely to end the day humming any of MacDonald’s themes, all are well-honed and consistently pleasing. In sum, Symmetry more than lives up to its eurythmic name: a burnished and cohesive group endeavor whose whole is actually greater than its parts. Definitely worth checking out. Two reasons to congratulate Kirk MacDonald (including a CD review) 1) Yesterday, the Canada Council for the Arts announced that the Toronto saxophonist has received a 2009 Victor Martin Lynch-Staunton Award. MacDonald, who turns 50 this year, and six other Canadian artists each received the annual award, which is worth $15,000, to recognize their achievements at mid-career. MacDonald was the recipient in the category of music. More details are here. 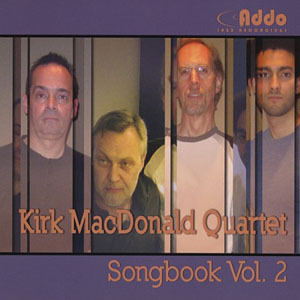 2) MacDonald recently released a fine new quartet CD, Songbook Vol.1, on the new Toronto-based Addo label, which highlights his considerable skills as a composer. Of course, he’s been recognized as a robust, substantial player with a flair for long lines filled with harmonic implications for the longest time. I think of Songbook Vol. 1 as containing two kinds of pieces. Three of the tunes are more jazzy than they are lyrical. One is Manhattan Getaway (which alternates harmonically tricky 7/4 and 4/4 sections in its form, not that MacDonald and his bandmates are perturbed). Moulage is a hearty composition with much to latch on to, which ultimately is So What when it’s solo time. On this track, pianist David Virelles uncorks a distinctive solo and when the tune vamps out, he and MacDonald happily bounce ideas off each other. Similarly, By Invitation Only is a winning composition that reveals its inspiration — the jazz standard Invitation — when the improvised solos begin. Before the tune concludes, there’s some creative thrashing from drummer Barry Romberg. The four other tunes accentuate MacDonald’s lyrical side.The opener, New Piece, is an eminently singable song set to a bossa groove. Its extended coda, featuring MacDonald coursing through a new and appealing set of chords is a nice exercise in delayed gratification. Over its seven minutes, Calendula, transforms from a pretty waltz brought in by Virelles into a torrid joust for him and MacDonald. 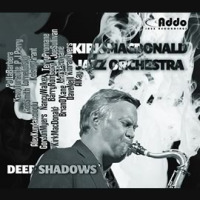 Fleeting features a surging groove and MacDonald playing both tenor and soprano saxophones. Goodbye Glenn, which closes the disc, is a swirling rubato tribute to the late Toronto saxophonist Glenn McDonald. 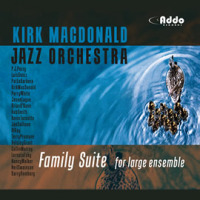 Family Suite is Kirk MacDonald’s sixth recording as a band leader, and sees him stepping out to front the multipart suite, which is a tribute to family members and close musical friends, past and present. 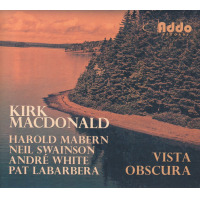 The CD is comprised of an eight track modern jazz suite, in eleven parts, all composed by MacDonald, and featuring Brian Dickinson on piano, Jim Vivian on bass and the omnipresent Barry Romberg on drums. Mr. MacDonald started to play saxophone at aged ten, and has went on to work with a sturdy list of leading jazz musicians including Claude Ranger, Dave Young, Sam Noto, Sonny Greenwich, Kenny Wheeler, Eddie Henderson, Harold Mabern, Walter Bishop Jr., Lorne Lofsky, Bob Mover, Pat LaBarbera, Phil Woods, John Taylor, and Ron McClure. All in all, he has played on over 25 jazz recordings as well as recording over 30 of his own compositions on CD. The highlight is the ten minute The Prod / Sister Kim, Movements II and II which displays an astonishing sensitivity and musical empathy between the combo members. Elsewhere, Four Shades of Light – Movement V, absolutely sparkles, bouncing off a fabulous piano run from Brian Dickinson. PURE AND SIMPLE Whenever Kirk MacDonald heads up a session you can be sure you’re in for a treat. Pure and Simple is just that, four top flight musicians having a great blow in the true jazz tradition. The cohesion amongst these players is remarkable as they weave in and out of ideas propelling each tune to thoroughly reveal itself. MacDonald brings his unique and authoritative sound as well as four of his own compositions to this session. His lines are a constant flow of ideas probing the limits of an idea yet always thoroughly grounded. The rich tapestry of colour and texture always grabs your attention. Five By Five begins with an extended sax piano duet where MacDonald’s plaintive searching sound plays against John Taylor’s ever responsive piano. Taylor is one of those players whose skill at support is seamless only to burst forth with sparkle, clarity and a sureness that disarms. The structure and openness of his improvisation are beautifully conceived and executed. All About Jazz musician pages are maintained by musicians, publicists and trusted members like you. Interested? Tell us why you would like to improve the Kirk MacDonald musician page.